Please note - this is a paperback release - no UK hardback release issued. Bodley Head, UK, 2011. Hardcover. Book Condition: As New. Dust Jacket Condition: As New. David Wyatt (illustrator). First Edition, First Impression. Signed, lined, dated and hand-numbered (out of 25 limited copies) by the author, who has also hand-illustrated this copy with a beautiful drawing. Synopsis : A brutal war against the united hobgoblin tribes rages, and Quenelda longs to accompany her hero Dragon Lord father into battle. But when the elite Stealth Dragon Services is ambushed and defeated - due to the dark treachery of the Grand Master - and her father is presumed dead, the Seven Sea Kingdoms are thrown into turmoil. 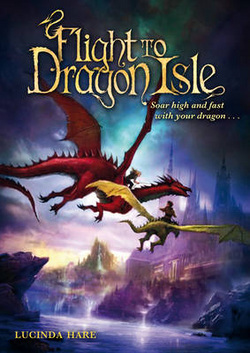 Evil plots swirl - with even Quenelda's own beloved dragon in mortal danger - but Quenelda finds a magical, secret solace at the heart of the fabled fortress Dragon Isle. Can she use her new powers to set the tide of victory turning against the hobgoblins? This book is accompanied by a large print signed by the author. Below are some examples of the remarques done for book one of this series (there are a few of these left, please see the dedicated page).